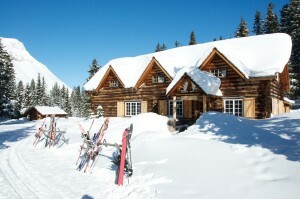 People come from all over the world to enjoy skiing out to Skoki Lodge and to Lake O’hara here in beautiful Lake Louise. It is an awesome experience and people of all walks of life can do the trip. It is important to be prepared and to have clear expections. Those expectations will define the gear you choose, the time your trip will take and how you will enjoy your expedition. At Wilson’s we are working very carefully to ensure that we have the best ski gear for your trip. When it comes to picking gear there are several systems that people like to use and it is up to you which one you pick. With MSR Lightning Ascent Snowshoes weight 1900 grams. If you have been out to skoki in the summer and enjoyed the hike you can have a similar experience with a shortcut across redoubt lake by using snowshoes. The good news is they are light, predictable, reliable and you will not be cold as you will generate lots of heat. They will climb any hills really nicely as well, especially with climbing bars. The only drawback is that you won’t get that exhilarating descent down from deception pass to the lodge on ski’s. If that isn’t for you the walk down on snowshoes is very safe and easy. 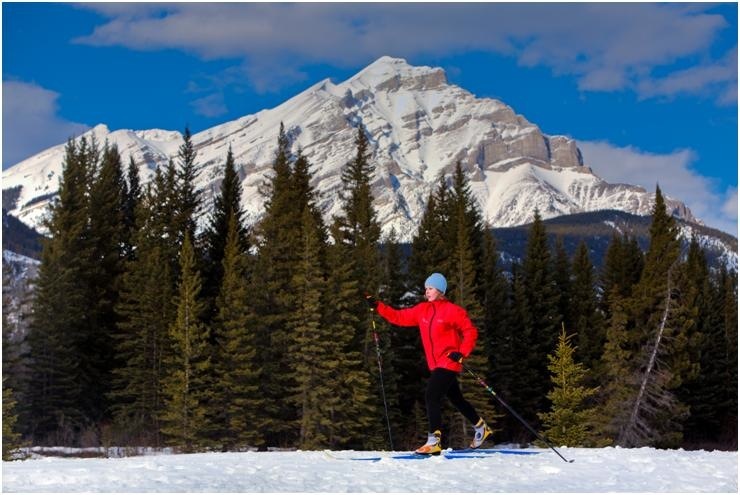 This system is super light and for a great deal of the trip it can work quite well as long as you are confident with your cross country skiing skills. Our friend and local hero Joe Nexhipi used to work at the ski hill and after work he enjoyed cross country skiing out to skoki, spending the night with his girlfriend and then skiing back in the morning. That system worked very nicely for Joe as it is light and fast. The only trouble is that when you go to climb up deception pass they can be tricky and without metal edges that descent down to skoki can be very challenging. 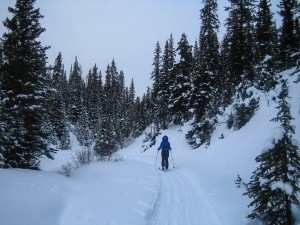 This system’s for the experienced and capable cross country skier. Wider Nordic ski’s with Metal Edges Weight 3500grams. Featuring the Salomon Xadv Free Grip ski’s with metal edges, wax less grip system on a wider ski with double camber for good grip and glide. For the skier that wants some grip and glide on a ski that is wide enough to give more confidence in variable snow but narrow enough to fit into the nordic ski track. Our system features x-adventure escape boots which keep your feet warm and dry and offer excellent comfort and support. This system is a popular choice because it is still very light like the cross country system. The advantage is that you can use skins for extra grip to climb deception pass. Going down to Skoki from Deception pass you can control the ski’s more as they are wider with a nice side cut (102-64-87) and metal edges. Some people even keep the skins on for the descent to keep from going too fast. These ski’s won’t grip and glide like a x-country ski because their camber and shape are quite different. Featuring the Dynafit Radical ST binding on DPS wailer Pure or nina 99 pure ski’s, Dynafit Stoke Ski’s, K2 wayback or talkback, and Fischer Hannibal 100 ski’s. Our touring boots are the best money can by with the Scarpa Maestraele or Scarpa Gea boots. This system works beautifully for going out to Skoki. 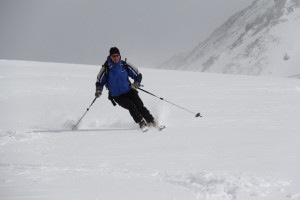 It is impressively light and you will be very confident for the descent into Skoki. The trick is to leave Wilson’s with your skins on your skis, go up the gondola and download ptarmigan. When you get to the bottom of the lift you will start skinning out to skoki. Simply keep the skins on until you are at the top of deception pass, next remove your skins, step into the bindings, lock your heel down and ski down to the lodge. All in all once you’re on the right gear for you, your trip will be just that much more enjoyable.